Software and technology have saved the day for countless people in so many ways in the past. There is an app for almost everything today and software comes in handy when managing things that were once complicated and tedious to handle. Leveraging software has not only helped companies of all kinds to transform the way business is done, but how fast it progresses too. For those in the plumbing industry, it’s good to know that there is a plumbing software for all aspects of the plumbing business. Even much better is the fact that rather than use various software to coordinate different parts of your business separately, you can simply get a software which can serve as a perfect all in one tool. This will help you to easily do all that you need to do when it comes to organizing and coordinating your business. Every aspect of your plumbing business can be handled with FieldSurf. It allows you to fully automate all the tiny details in your business and hands over control to you totally. FieldSurf can be a trusted assistant from the moment a call comes in for your services to the very last moment when payment is made. It can even go further serving as a record-keeping tool whenever you need it even long after a task is completed. Perhaps one of the most hectic aspects of managing your plumbing company is managing your inventory. Keeping track of all the important plumbing tools and essential repair and replacement parts you have in your store can be very hard. BeforeFieldSurf, you had to depend on manually entering each product painstakingly when you purchased. You will also have to depend on your staff to always check a product out when they take it out of the store to be used. You have to admit that this process is prone to human errors. It is possible that due to some oversight, someone fails to check out an item when it is taken out. You also have to admit that the system can be easily cheated on the event that you, unfortunately, have someone who wants to do so. With FieldSurf, the game is a lot different. First, every item that comes into your store is effectively documented in FieldSurf’s inventory module. You can even add a picture of the product if you want to. You can also add the product barcode and a short description as well as the number of items you added to the inventory database. Now when a product is brought out of your store, FieldSurf helps you keep track of it. The Beauty of this plumbing software is that you know exactly when the item was taken out and who exactly did so. You will also be able to tell on which job the item in question was used as well as its final destination whether it was sold, or used in completing a job. FieldSurf automatically deducts the product from the list of items in your inventory once it has been sold or used. It is a completely seamless process that requires little or no input from you. But it gets even better. In the former days, it is possible to discover you have run out of an item just at the time when it is urgently needed. This can throw you off balance and affect productivity. You can easily avoid situations like this with FieldSurf. You can easily set up a reminder on our software which allows you to keep track of the level of every item in your inventory. FieldSurf automatically alerts you whenever an item is running low in stock so that you can easily replace it long before you run out of it completely. It’s a whole new way to handle inventory. Plumbing companies already making use of this unique function can testify to how effective this software is in managing their inventory. FieldSurf keeps you up to date with everything that concerns your plumbing inventory and being aware at all times is one of your greatest assets. And the fact that it does it almost completely on its own makes it even better. No more tedious and monotonous paperwork just to manage your inventory. No matter the size of your company, big or small, FieldSurf manages it effectively without putting any pressure on your staff. Having a software this effective will without question, increase plumbing sales. Welcome to the age of high-speed payment software. Another aspect of the business that FieldSurf has completely revolutionized is how payment is made and received in your plumbing business and how much time the entire process takes. It doesn’t take a business genius to see the stark difference between handling payments with FieldSurf and our payment software & doing it manually. It’s a lot faster, simpler and definitely more effective. Aside from the many possible errors usually associated with manually organizing payment the traditional way, paper is very slow and very boring. It’s a system made up of several working wheels and if you leave too many things to chance, things can get a bit messy even in the hands of the most qualified staff. Why not give your staff a payment software that will make processing and receive payments a lot easier and faster? One of the major places where things get delayed and messed up in payment processing is invoice management. In the past, the process of preparing an invoice used to be quite tedious. There are times that out of oversight, invoices are not sent on time or not even sent at all. This delays payment processing on both ends. It will take time to get the invoice prepared on your side of the board and a load of time is wasted again on the other side with your client as well. With this payment software, the process is automated and made much easier and faster. The invoice is prepared instantly as the work order Is prepared, and the bill is sent to your client from the software to your client’s email immediately the task is signed off as completed. No more slowness and the regular delays associated with managing invoices. Ditch the paperwork and switch to a payment software you can trust. One of the new frontiers which FieldSurf helps your company attain is on-site payment processing. In the past, you can have a backlog of unsent invoices and a lot of your payments yet to be made because of the slow and hectic process involved in processing payments on both sides. But with this payment software, you can now receive payments the very day you complete a task right there in the field. After a job is completed, your client can inspect the job and if they are satisfied, they sign on your field technician’s mobile device. Once this is done, FieldSurf sends a bill with all the payment details to your client’s email instantly. Sweet right? No more weeks of preparing the invoice on your side. And if you want, you can receive payments right there in the field. FieldSurf has a function that allows you to receive payment instantly by swiping the client’s credit card on FieldSurf’s credit card swiping device and your customer gets a confirmation of the payment immediately if an internet connection is available. In cases when an internet connection is not readily available, or the card isn’t physically available. You can simply collect the client’s details into the payment software and the payment is instantly processed the moment you reconnect to the internet. Asides the fact that a faster process of managing payment is healthier for your business, receiving payment this way is less prone to error than the traditional system. Reduced timing and cost: without FieldSurf’s payment software, processing payment can take as much as 4 days to weeks before you receive payments if you factor in all the delays from your side and the extra time that it will take your client to respond. But with this payment software, you are cutting down on that to the barest minimum. It’s like lightning speed with FieldSurf when you place them side by side. You can cut down drastically on losses accrued through bounced checks, rejected cards, or unpaid invoices which will amount to extra processing cost if FieldSurf isn’t used. Error reduction: a combination of electronic invoicing and on-site card processing helps you to cut down on errors associated with manual payment processing whether human or otherwise. By using FieldSurf to process payments efficiency is guaranteed in that area of business that most plumbing companies have issues with. Even your customers are happier to be able to get every detail of this business to settle all at once and not have to wait for days or weeks to get an invoice from you. Another advantage of using FieldSurf to manage payment for your business is how it helps to break things down for your plumbers. With little or no knowledge of business or accounts at all, your field technicians through the FieldSurf software can manage on their own. They can give quotes on the field, are aware of all the items available, how much each cost, and can help with receiving payments from your customers in real time. Since invoice is sent on-site, your field techs can answer any questions or clarification your client might need about the completed task or the invoice sent. With this, you get more satisfied customers who will trust your business even better and will be interested in hiring you in future and recommending your business to others. Another area of Payment management which FieldSurf helps you coordinate effectively is in the management of payment records for future reference purposes. FieldSurf helps you manage all records of your financial transaction by keeping a record of every detail so that you can easily access them in case you need to do so in the future. FieldSurf keeps a secured electronic record of your business transactions at all times and you can easily refer to them whenever you need to. It’s always available on the go and helps to resolve all issues that might arise in the future. There are just a few of the many ways FieldSurf turns around the way you coordinate your plumbing business. It has a lot of amazing features that help you automate every aspect of your business, improves your service delivery drastically and promotes a smooth and seamless relationship within your organization and between your business and your clients. The software helps you to manage the process of dispatching, handle payments for your staff, and manage your accounting records easily and effectively. All on an easy to use interface. 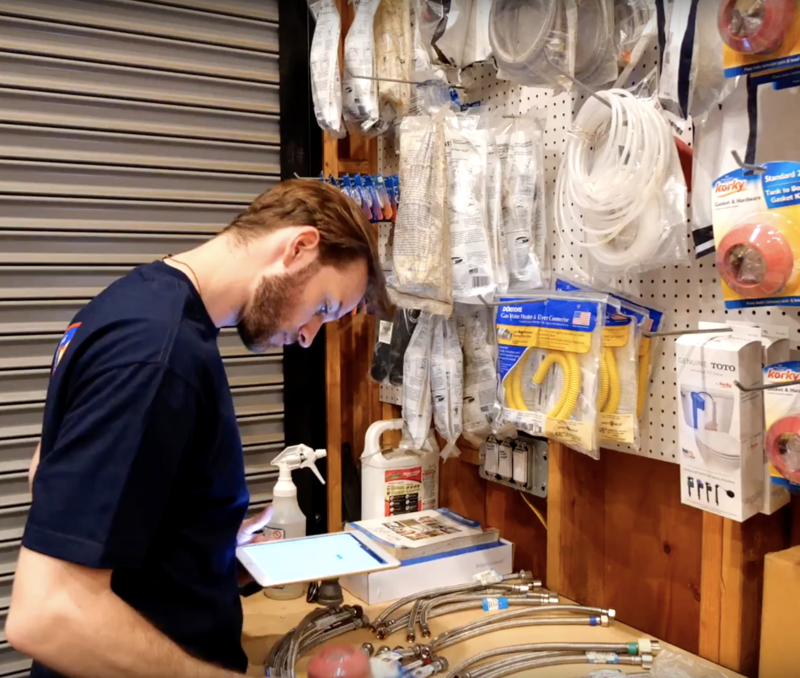 FieldSurf is no doubt America’s top plumbing inventory management and payment software and by far the cheapest all-in-one business solution out there. It is easy to use, requires no special training for your office and/or field staff and works perfectly on all types of mobile phone, laptop and tablets.